In fact, as some of you may recall, an AMD executive publicly stated a year ago that there was no “DirectX 12″ on the Microsoft roadmap. Microsoft responded to those comments by affirming that it remained committed to evolving the DirectX standard and then said nothing more on the topic. 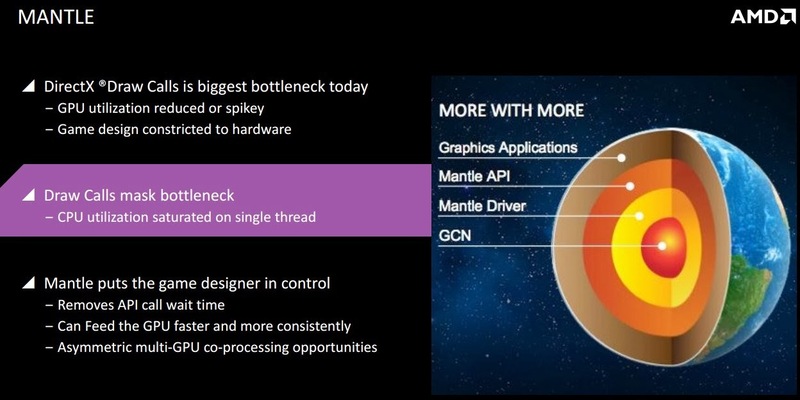 Then AMD launched Mantle, with significant support from multiple developers and a bevy of games launching this year and apparently someone at Microsoft decided to pay attention. Note: Microsoft has not confirmed “DirectX 12″ as an actual brand name for the next-generation of DX technology. It’s used here as the most logical version number. We’ve spoken to several sources with additional information on the topic who have told us that Microsoft’s interest in developing a new API is a recent phenomenon, and that the new DirectX (likely DirectX 12) will substantially duplicate the capabilities of AMD’s Mantle. The two APIs won’t be identical Microsoft is doing its own implementation but the end result, for consumers, should be the same: lower CPU overhead and better scaling in modern titles. This has already been read in several circles as to be the death knell for AMD’s custom API, but such claims are short-sighted, for multiple reasons. First, there’s the fact that DirectX 12 is almost certainly 12-18 months away. Second and equally important there’s the fact that Microsoft has been locking DirectX releases to Windows versions. DirectX 11.1 is only available on Windows 8; DirectX 11.2 is only available on Windows 8.1. Microsoft has every reason to synchronize the launch of DX12 with its next version of Windows and if it follows its typical MO, that means DirectX 12 will be most likely be a Windows 9 exclusive. Microsoft, of course, doesn’t have to play its cards that way, but if it does, Mantle may remain relevant as a cross-platform alternative for extending close-to-metal benefits across the gaming stack. Of course, OpenGL may or may not be capable of performing the same tasks in the same time frame but less is known on that front. Hardware support could also complicate matters if DirectX 12 closely maps to Mantle, it’s possible that today’s GCN GPUs will still support it. Alternately, if it doesn’t, then Mantle may become the preferred option for ensuring broad backwards compatibility. And if Mantle is ultimately subsumed by DirectX so what? When I first talked to AMD about the next-generation API at APU13, the developers candidly told me that the long-term goal was to get Microsoft and the Khronos Group in charge of OpenGL to adopt a Mantle-like architecture. The entire point of Mantle was to spur game development and drive the adoption of a better standard.